Since the financial crisis of 2008, an explosion of research has aimed to understand what makes financial markets prone to sporadic crises. The potential sources of trouble are many, including debt and leverage, financial concentration and the problem of “too big to fail,” as well as perverse incentives for bankers to take on large risks. Markets go wrong in any of a thousand ways, and, unfortunately, it seems that understanding each one requires intimate familiarity with the fine details of the financial architecture, contracts, legal regulations, individual incentives and so on. Yet a narrow focus on details can distract attention from profund similarities. Network scientists know that the topology of a network – the pattern of links or relationships that hold it together – can have a decisive influence on its properties. 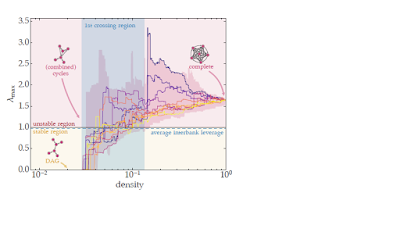 In the context of financial networks, new research suggests that subtle changes in network topology may be the key to understanding a common pathway by which financial markets become unstable. For all the forbidding complexity of the modern financial system, they suggest, instability tends to follow from the emergence of particular cycles or closed circuits of dependence within the network topology, as these tend to amplify disturbances or distress. I'll explain the basic logic of the work briefly below. It's a theoretical paper, and not meant as a recipe for detailed practical policy. But it does help clarify a basic mechanism that drives instability, and offers broad insights on the kinds of policies that could avoid it. First, a little background. Some of the motivation for this work comes from the history of thinking in ecology. Back in the 1970s, ecologists widely believed that the stability of an ecosystem would generally be enhanced by increasing complexity, as reflected in the presence of a large number of interactions between a diverse set of species. But the theoretical ecologist Robert May overturned this intuition, at least partly, by showing in simplified network models of food webs that complexity can in some cases undermine stability. His analysis indicated that networks with a larger number of interactions could be less stable, and inspired ecologists to begin searching for possible new factors that might account for ecosystem stability – for example, the presence of specific topological motifs within food webs. Just after the financial crisis, May – who was formerly the Chief Science Advisor to the UK Government – joined with the Bank of England's Andrew Haldane in arguing for the relevance of this insight to the stability of financial systems as well. Financial networks have grown enormously more complex in the past 30 years, and, as May and Haldane noted, the pre-crisis literature in economics and finance mostly viewed this as a good thing. Traditional thinking held that more complexity, achieved through a wider spectrum of financial instruments, greater diversification and wider spreading of risks, would improve stability. Yet May and Haldane pointed to a handful of studies, mostly in the last decade, linking rising complexity with increasing instability. Six years later, this idea that too much complexity can cause trouble is becoming less “radical,” although the story also remains unsatisfyingly complicated. Models serving as examples tend to include fairly intricate details of how financial institutions interact – particulars of contracts, for example, or mechanisms for debt default resolution. Do such details always play a decisive role? Or is there a simple and general story about how changes in network topology create instability that stands above the details? This is the question asked – and answered, in the affirmative – by this paper. 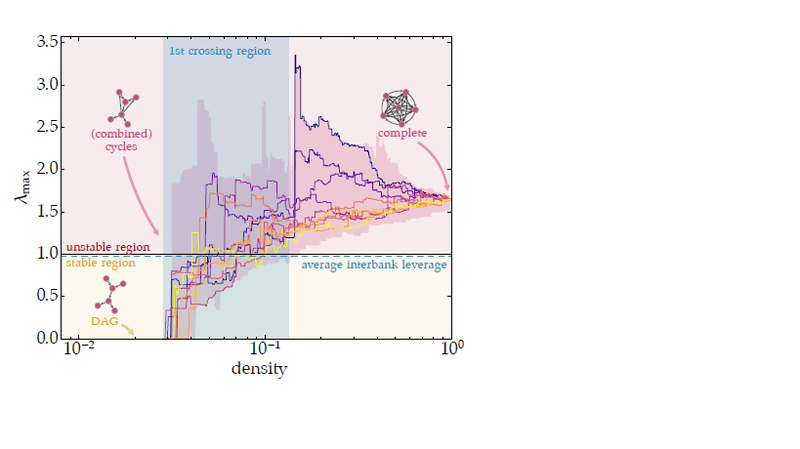 What Marco Bardoscia and colleagues do is to study a class of models of the Interbank network, and probe the stability of the network as they vary two parameters characterizing its complexity. These are 1) market integration, reflecting the number of banks participating in the financial system, and 2) diversification, referring to the proliferation of financial contracts. Importantly, the study doesn't test stability in the usual way of running stress tests and estimating the total losses likely to amount from some assumed shocks to the system. This approach requires specific assumptions on the nature of the financial contracts and mechanisms of distress propagation, making it difficult to draw general conclusions. Instead, Bardoscia and colleagues study how gradual changes in the interconnection pathways in the network can create mechanisms that tend to amplify small disturbances, rather than dampening them away. For example, the figure below illustrates how the network goes from being stable to unstable just due to gradual diversification, normally thought of as beneficial for risk management. It shows a network eigenvalue λmax reflecting whether the propagation dynamics of the network dampen (λmax < 1) or amplify (λmax > 1) small disturbances. The researchers used the balance sheets of the top 50 listed banks in the European Union as a starting point, and then simulated a process in which banks gradually increase the degree of diversifi cation by creating further exposures towards additional counterparties. They carefully rebalanced the network at each stage to keep the assets and liabilities consistent with the original balance sheets and the interbank leverages of all banks fixed. As the degree of diversi fication increases, a bank's exposures spread out across ever more counterparties. Even though the total interbank exposure of each bank remains constant, the banking system eventually goes unstable, and it doesn't even take a lot of diversification to make it happen. As the figure shows, instability first arises when contracts link together just 3% of all the possible pairs that could in principle be linked. This example illustrates the transition from stability to instability as complexity increases through diversification. The paper equally establishes that a simular transition takes place if complexity rises just through an increase in the number of banks. The conclusion is that more complex and highly networked markets should generically tend toward instability. A financial system can go unstable as the number of banks increases, or as the number of contracts among banks increases, even if the individual leverage of banks does not increase. In either case, instability appears as a holistic, network effect, even though each bank individually has an unchanging risk profi le. The implication: financial policies that seem wise from the point of view of the risks to individual banks can actually – and counter-intuitively – increase fi nancial instability to the whole system. The paper also goes into some detail on the origin of such instability, which lies in the fact that in both processes banks get increasingly involved in multiple cycles (i.e. closed chains) of contracts. This is an interesting technical detail that I won't get into, although such factors might well prove useful as targets for monitoring by authorities. In any event, it's clear that systemic risk cannot be reduced through measures long thought to reduce risks in standard economics. Banking proliferation and diversification, if excessive, can create worse problems than they solve.